Description: Badrinath, located in the lofty Himalayan heights 10400 feet above sea level is a pilgrimage center held in the greatest esteem all over India. It is an arduous mountain route to Badrinath from Rishikesh or Haridwar in the Garwahl Himalayan region, where roads get blocked with landslides during the monsoon season. Badrinath stays closed 6 months a year from Deepavali all the way until the full moon day in the month of Chittirai (late spring in the Himalayas). 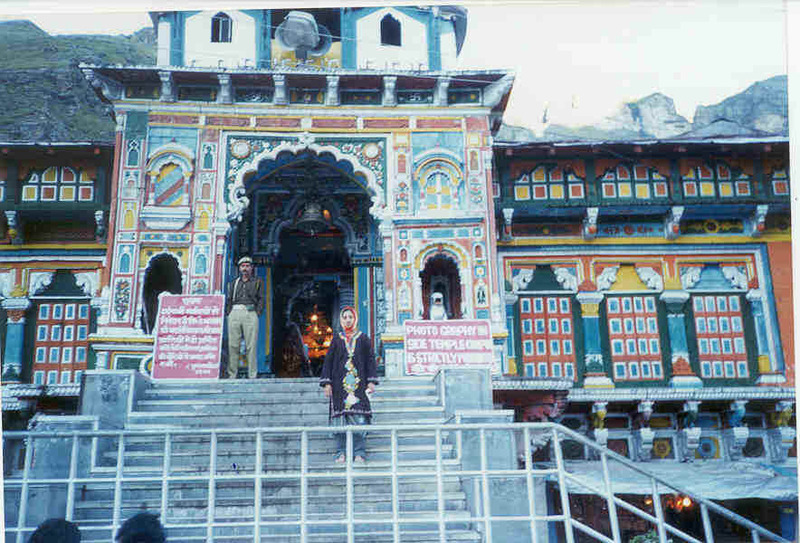 Please read Templenet's special feature on Himalayan shrines, for more information on Badrinath. Enroute are the pilgrimage sites of Devaprayag, Rudraprayag, Karana Prayag, Nanda Prayag and Vishnuprayag. Enroute are Pandukeswar where the Pandavas are believed to have been born, and the site where Bhima and Hanuman (sons of Vayu) met. Hot water springs of Taptakundam are seen on the banks of the Alaknanda at Badrinath. The lofty peaks Neelakanta Parvatam and Nara Narayana Parvatam are visible from the temple. The image of Badrinarayanar here is fashioned out of Saligramam. Badrrinarayana is seen under the badari tree, flanked by Kuberan and Garudan, Naradar, Narayana and Nara. Mahalakshmi (referred to as Aravindavalli in the Sree Vaishnava tradition) has a sanctum in the prakaram. There is also a shrine to Adi Sankarar. The Bhrama Kapalam north of the temple on the banks of the Ganga, is the site of performance of remembrance rites for the ancestors. Behind the temple of Badrinarayanar is the Lakshmi Narasimha mandir, with shrines to Desikacharyar and Ramanujacharya. Tirumangaialwar the Tamil Alwar saint of the 9th century CE, mentions Badri in his work Siriya Tirumadal, and praises its glory in two decads of 10 verses each. In one of the verses, of a decad of paasurams dedicated to Tirukkandam, Periyalwar states that Vishnu enshrined in Mathura, Salagramam, Dwaraka, Ayodhya and Sree Vaikuntam is the same as the one (Purushottaman) enshrined in Tirukkandam or Kadinagar (Devaprayag).